Phi Phi Island (in Thai: หมู่เกาะพีพี) is an archipelago of six islands, the largest of which are Phi Phi Don and Phi Phi Leh, located in the southern part of Thailand, in the Andaman Sea. Having been chosen as the location of the Leonardo di Caprio film “The Beach”, Phi Phi Island (even though there are two islands, they are written in the singular) has become a popular destination for international tourists since 2000. 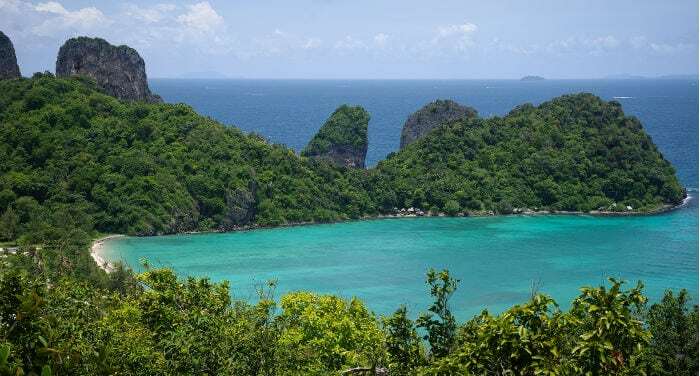 Even though it is possible to visit all six islands, when talking about Phi Phi Island you’re mainly talking about Phi Phi Don, the only inhabited island. The smaller Phi Phi Leh, instead is mainly an afternoon boat tour, where you can admire Maya Bay, the bay where the majority of the scenes from The Beach were filmed. Phi Phi Don covers some 30 square kilometers. Phi Phi Leh measures just a little more than 6 square kilometers, and besides its beautiful beaches you can also visit caves like Viking Cave, located to the northeast.